Long an integral part of the life of this small town located near Colorado Springs and the base of majestic Pikes Peak, The Cliff House at Pikes Peak was built in the winter of 1873 and has been open to guests longer than Colorado has been a state, compiling a fascinating history of its own over its 125 years. 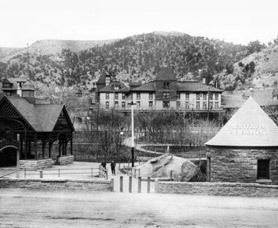 The town of Manitou Springs grew up around the gold mines in the Pikes Peak area in the late 1850s. The structure that became the 20-room boarding house known as “The Inn” originally was a stagecoach stop on the route from Colorado Springs to Leadville, one of the most famous stagecoach runs of the American West. Even the earliest guests, mostly trappers and hunters on their way to or from Colorado Springs, were drawn to the inviting parlors and rambling porches. When the mines in Leadville proved bountiful, many rich capitalists made their way through Manitou Springs, bringing more business to the small inn. There were times when tents had to be pitched next to the building to accommodate the overflow of guests. When the gold strikes in the Pikes Peak region began to play out, travel through Manitou Springs dwindled. By 1876, The Inn was struggling to find guests. Fortunately, over the next half-dozen years, interest in the town’s ancient mineral springs was beginning to increase. For hundreds, perhaps thousands, of years, the springs had bubbled up from underground limestone aquifers that carbonated the water and infused it with minerals. The water was cool, good-tasting and had a high concentration of minerals that benefit the body. American Indians had been drinking it straight from the springs for hundreds of years, believing them to have healing powers. The Inn’s future was intertwined with the springs by Edward E. Nichols, who had come West in the 1870s to fight a battle with tuberculosis. Having beaten the illness, Nichols moved permanently to Manitou Springs, a town where he served as mayor for eight terms. 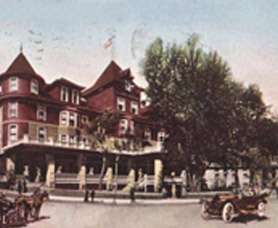 In 1886 he bought The Inn, renaming it The Cliff House and converting it to a sophisticated resort hotel that capitalized on the sparkling waters and mineral springs in the region. In 1914, Nichols collaborated with the state’s governor, Oliver Henry Shoup, to found the Manitou Bath House Company. The new company turned the struggling community into a resort specializing in water therapies. 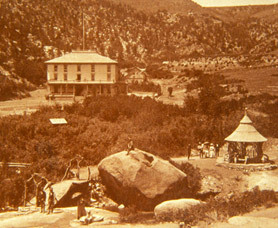 The Cliff House at Pikes Peak capitalized on the sudden influx of wealthy clients eager to take advantage of the healing powers of the springs. The hotel became a resort for the wealthy and remained popular well into the 20th century. 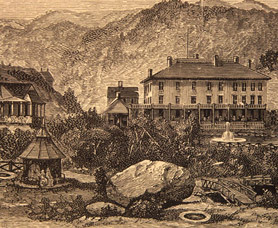 In the 30 years that followed the founding of the Manitou Bath House Company, Nichols expanded the hotel from 20 rooms to 56, and eventually to 200. The result was the beautiful, four-and-a-half story building that still stands today. The Cliff House at Pikes Peak became a prime vacation destination for the wealthy, and guests included Theodore Roosevelt; Ferdinand, Crown Prince of Austria; William Henry Jackson; Charles Dickens Jr.; P.T. Barnum; Thomas Edison; Clark Gable; F. W. Woolworth; and, J. Paul Getty. All guests of The Cliff House received the personalized attention expected at a premier resort hotel. Concerts were scheduled on the grounds each evening, and each morning guests were given programs detailing the evening’s entertainment. Each evening, guests enjoyed formal dinners, then delighted in the evening’s concert. After enjoying the entertainment, guests were encouraged to walk across the street to the Soda Springs for a glass of fresh spring water before retiring. The Cliff House at Pikes Peak even had underground tunnels leading from the hotel to the spa across the street. In later years, a bathhouse was built at the spa and bell boys from the hotel would cross to the spring to fill bottles and glasses with the sparkling water for the guests. The Cliff House at Pikes Peak soon became the most popular hotel and spa in the Colorado Springs region, drawing people from all walks of life and from around the world. For all its successes, The Cliff House at Pikes Peak also endured some hard times and disasters. In 1921, a flash flood roared down Williams Canyon and washed through the hotel’s Grill Room, a small sandwich and soda shop in the rear of the East wing, destroying all the hymn books and buckling the floor all the way to the ceiling. California real estate developer James S. Morley bought The Cliff House at Pikes Peak in 1981, turning the historic building into a 42-unit apartment building. But in its second disaster of the century, the building caught fire in March 1982, the fourth floor roof sustaining so much damage it had to be replaced. In addition, the interior was stripped of all plumbing, plaster and floor coverings. The water damage sustained from the fire was so extensive as to threaten the very existence of the building, so immediate action was taken to preserve what remained. Due to the local economy, the building stood vacant for 16 years. As The Cliff House had been placed on the National Registry of Historic Places, the fire also raised concerns among citizens groups and government agencies that supported its renovation. In 1997, Morley committed to the restoration, vowing to restore the hotel to its original distinction and fame, preserving the Rocky Mountain Victorian architecture of the 1800s, but incorporating 21st century state-of-the-art technology and amenities. The investment of $10.5 million in restoration, refurbishing, and loving care realized this vision. In September 2007, Gal-Tex Hotel Corporation purchased The Cliff House and immediately committed additional capital to further enhance the property. Gal-Tex Hotel Corp. and 1859 Historic Hotels L.L.C. kept the same core staff to continue to improve the excellent reputation that the team had established. Gal-Tex and 1859 Historic Hotels have since added an East Addition at the cost of approximately $1.7 million. The addition includes a full-service bar (Red Mountain Bar and Grill), a spacious fitness room with new equipment, a garden patio with a fire pit, an intimate meeting room (Williams Canyon) and, on the third level, a space was created with an outdoor event atmosphere but with the ability to adjust to accommodate inclement weather. Moving windows allow the Cathedral Spires Pavillion to be one of the most unique event spaces in the region. Going forward, The Cliff House has plans to expand and upgrade the guest experience even further. Gal-Tex, 1859 Historic Hotels and The Cliff House are committed to providing the finest in hospitality.